To celebrate I’ve written my very first garment pattern! The pink and yellow are scrap yarn given to me so I don’t really know what they are. The pink is probably acrylic but the yellow feels like mohair. I like how the the fuzziness gives it different textures. I didn’t make this up all by myself though. It’s inspired by this knitted sweater by Kate Knits. I love the shape of it and really wanted to make it but I couldn’t understand the knitting instruction. So I thought maybe I can make up something similar with crochet. Note: I blocked the top part of the sweater before taking the measurements below. As you can see, the construction is fairly straightforward, and it works up very quickly (I made it over the Easter long weekend while watching action movies on TV :D). Though I messed up the stitch calculation for the shell pattern rows in the one I made, but I think I’ve got it figured out now for the written pattern. But since this is the first time I try writing a garment pattern there may be lots of mistakes — so if you try it and spot anything wonky please let me know, I’d greatly appreciate any corrections and feedback! Yarn: I used four 50g balls of sport weight yarn for the main colour (MC), plus a bit of pink (C1) and yellow (C2). If you’re making a larger size more yarn will be required. Hook: 6mm — I wanted the gauge to be pretty loose so the fabric will drape nicely. 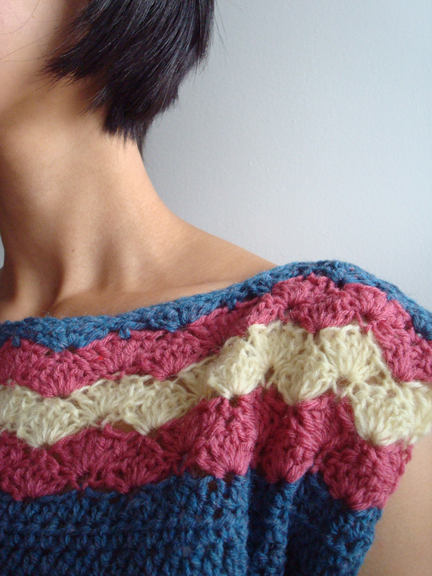 Sweater is crocheted flat, bottom up, in two identical pieces (front and back) and sewn together at the shoulder seams and side/underarm seams. Guidelines for smaller/larger sizes are in italics. For smaller/larger size, minus or add 6 stitches in the foundation ch. 6 stitches measures about 2″. Row 2: ch 2 (turning ch counts as an hdc. ), hdc in next hdc, hdc in each hdc across, hdc in top of beginning ch, turn. Repeat row 2 until piece measures 13.5″. 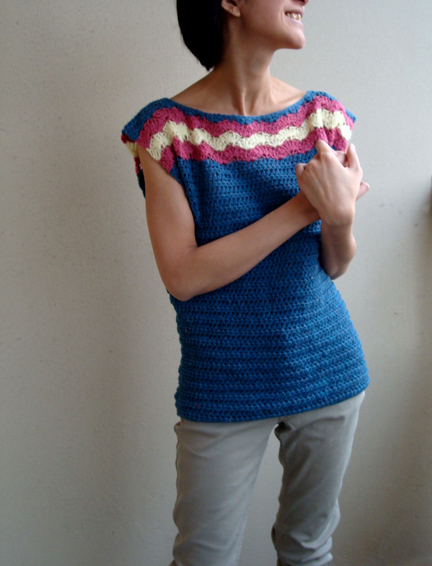 For smaller/larger sizes, crochet to desired length measuring from underarm. Each hdc row measures about 0.5″. Row 1: at the end of last row of body, ch 7, hdc in 3rd ch from hook, hdc in each of the next 5 ch, hdc in each hdc across, hdc in top of beginning ch. Take hook off loop, but don’t fasten off. Attach a separate ball of MC to the top of the hdc that is directly below the last hdc just made, ch 6, fasten off. Place hook back in the loop where it was left off at the end of last row, hdc in each of the 6 ch just made, turn. For smaller/larger size, minus or add multiples of 3 ch on each of the sleeves, just be mindful that the total stitch count needs to be a multiple of 6 plus 1 for the shell pattern later on. Repeat row 2 seven more times. For smaller/larger sizes, measure from top of shoulder to underarm, then minus 4″ (shell pattern rows), and crochet to that length measuring from the start of the sleeves. Each hdc row measures about 0.5″. Fasten off MC, attach C1. Row 1: ch 3 (counts as 1 dc), 2 dc in first hdc, skip next 2 hdc, sc in next hdc, *skip next 2 hdc, 5dc in next dc, skip next 2 hdc, sc in next hdc*. Repeat from * to * until last 3 hdc, 3 dc in top of turning ch, turn. Row 2: ch 1, sc in first dc, skip next 2 dc, *5 dc in next sc, skip next 2 dc, sc in next dc, skip next 2 dc*. Repeat from * to * until last 3 dc, sc in top of turning ch. Fasten off C1, attach C2. Row 1: ch 3, 2 dc in sc, skip next 2 dc, sc in next dc, *skip next 2 dc, 5 dc in next sc, skip next 2 dc, sc in next dc*. Repeat from * to *, 3 dc in last sc, turn. Repeat row 2 of C1. Fasten off C2, attach C1. Repeat rows 1 and 2 of C2. Fasten off C1, attach MC. MC row: ch 2, hdc and dc in first sc, skip next 2 dc, hdc in next dc, skip next 2 dc, *[dc, hdc, sc, hdc, dc] in next sc, skip next 2 dc, hdc in next dc, skip next 2 sc*. Repeat from * to * until last 3 dc, hdc in top of turning ch, turn. ch 2, hdc in each of next 13 hdc, dc tog next 2 hdc, fasten off. Count 15 stitches from the end of the row toward the center, attach MC to the 15th stitch. ch 2, dc tog next 2 hdc, hdc in each hdc across, hdc in turning hdc, fasten off. For smaller/larger sizes, measure how wide you want the neck opening to be and the width of your shoulders, and determine the stitch count for the shoulders row accordingly. Repeat entire piece once more. Attach MC to center back of neck, sl st in each st around neckline, fasten off and weave in ends. Sew underarm and side seams together. Weave in ends. Attach MC to center back of the bottom of the sweater, ch 1, 1 sc in same st, 1 sc in each st around, sl st in first sc, fasten off and weave in ends. Note: I didn’t crochet a finishing round around the arm openings, I just made sure that I weaved in all the ends neatly. It looks so good on you! 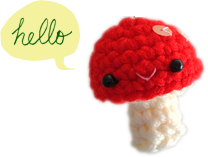 Adventures in crocheting! Are you sporting a new haircut? Love it!!! Happy 2nd anniversary!!! Your sweater looks great, and drapes so well! It looks like a great tutorial too, thanks for sharing! Please let me know what size you are so I expand it right I love you site. You are amazing! Thanks for all you do. thanks Billie! 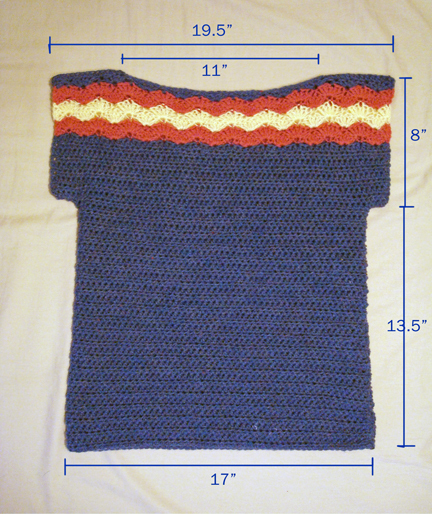 the measurements of the sweater is in the diagram above (in the post). it’s 34″ around the bottom of the sweater. i’m not sure what size that is… but hope it helps! I tried your pattern. I used Worsted yarn, as I wanted something heavier. I LOVE YOU colors and the way this turned out. I’m going to make another one in a lighter yarn with Burnt red, Light yellow, and Teal. Here are the errors I found, not a big deal to those who know how to crochet. The last one should read …* until last 3 dc, dc and dc in top of turning ch, turn. ch 2, hdc in each of next **13 hdc**, dc tog next 2 hdc, fasten off. 3.) Count 15 stitches from the end of the row toward the center, attach MC to the 15th stitch. ch 2, dc tog next 2 hdc, **hdc in each hdc across**, hdc in turning hdc, fasten off. I LOVE YOUR PATTERN. LOOK ON RAVELRY SOON FOR MY 2ND PIECE! The last one should read …* until last 3 dc, dc and half‐double crochet (I put dc instead in my previous post) in top of turning ch, turn. 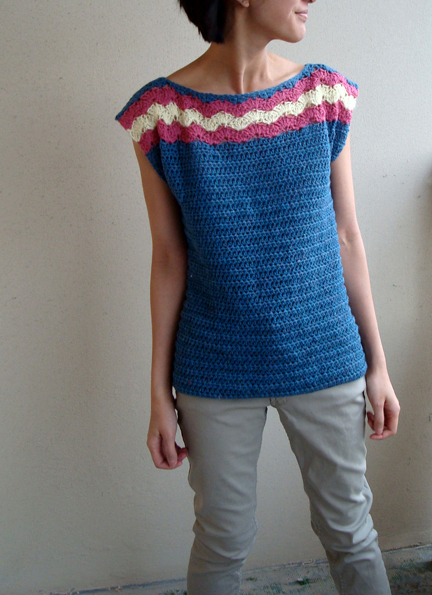 Thank you very much Trish for this great pattern! It’s amazing! I used your pattern to make my daughter (14 yo) a shirt. It was my second attempt at crocheting a piece of clothing and I couldn’t be happier. Your pattern is straight forward, easy to follow & the results made me do a happy dance. Oh! and I’ve actually gone up a notch on the “cool‐mom” scale (not an easy thing to accomplish w/a 14 yo). wow, it looks awesome! love the colours and the sedge stitch! thank you for giving the pattern a try! My friend and I are doing each other a favor, she will convert a baby wrap in a carrier for me and she asked me to crochet a top for her. Love yours, so I’m about to get me some yarn. I know it has been a while you created this, but can you recall the length per ball for the MC? She wants a woolen top but 50gr Merino might not refer to your yarn. If not I will keep my fingers crossed I ordered enough. hi sandra! thank you so much for trying out my pattern! sadly i don’t know for sure the length per ball for the MC… it was a discontinued “sunbeam” yarn. i checked ravelry for a similar yarn, and i think i can safely guess that each ball is no more than 120 yards. hope this helps! happy crocheting! Took me some time, but it’s almost finished! Shall I email you pictures of the result as soon as it’s done? Love your sweaters and other goodies you have created and made..
thanks so much for visiting, beverlee! Thanks for the awesome pattern. I am definitely going to make this today. Love the floors too. Colours not floors .… Pops!!! What size shirts do you wear for reference? Hi Virginia! small or extra small. hope this helps!